In september 2012 publiceerde Kythera-family.net in hun nieuwsbrief een interview met ons. Kythera-family.net is een engelstalige website opgezet met als doel het samenbrengen van zoveel mogelijk materieel en immaterieel erfgoed van Kythira. Op de website vindt u veel oude foto’s, verhalen, historische documenten, gedichten, liedjes, familiestambonen etc. Voor informatie zie www.kythera-family.net. On the little-traveled road between Aroniathika and Pitsinathes there is a stone road going up to the left with the sign “Fos ke Xoros” at the turnoff. “Light and Space” is the name of the guest house owned an run by the industrious Dutch couple Anita and Albert. Since it’s opening in August 2009, the popular retreat has been full of guests from all over the world, even in the early spring and late autumn, which are usually very quiet months for tourists on Kythera. Here Anita and Albert tell us about the origins of their project. How did you first discover Kythera? By a total coincidence. We were planning a last minute trip to Greece and didn’t know where to go. So we took a travel guide of Greece, we closed our eyes and just put our finger on a page. We landed on Kythera, which we had never heard of. We even wondered if there were people living there! Actually a Dutch charter had just started flying to Kythera so we went for a fantastic 2 week holiday. How many years were there between discovering Kythera and deciding to build a guest house? 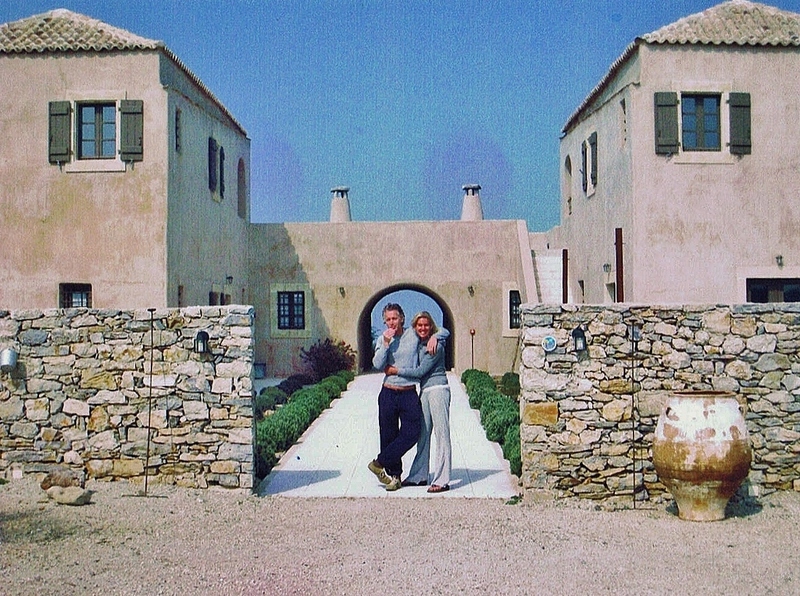 We visited Kythera for the first time in 2004 and then in 2006 again. After this second visit we made our mind up and choose Kythera as our new home place. A year earlier, in June 2005, we had already already decided to emigrate to Greece and to build a guesthouse. Finally in january 2008 we arrived on Kythira with a busload full of furniture. What was the hardest part about creating the guest house? The actual building of the guesthouse was not so difficult and went very quickly (in 8 months it was ready). We opened the doors of the guesthouse in August 2009. But the hard part was creating the guesthouse on paper. We are very perfectionistic. When in the past we visited hotels we always noticed that it are the details which make the difference. So we spent a lot of time thinking about these details and doing research. Also we made a scale model of the building. With the model we could easily decide how to organize the rooms in a nice and comfortable way. For instance things like connection for electricity, internet, TV and radio are not easy to change afterwards. When you don’t think about it there is a big change you will regret this later. Although there are still some small things we would now probably do differently, at the end we are very pleased with the result. The hotel is very traditional – did you know what you wanted it to look like before you started or did you leave the design – interior and exterior – to others? We love the traditional Greek style and we already had a lot of ideas for the design both interior and exterior. The problem however is to find someone who can translate your ideas in to reality. We were lucky to have a local builder, Panayotis Magonezos, who himself loves the traditional style and has a great eye for detail. Together with him we made the plans for the building. For the interior we tried to find a good balance between tradition and luxury. We want our guests to feel at home and the biggest compliment is to see that people even on a rainy day enjoy themselves inside the rooms. Do you miss living in Holland? Not really. We like to go to Holland to see friends and family once every 1 or 2 years but when we are in Holland we really miss Kythera. So in fact it is the other way around. Luckily a lot of friends come and visit Greece and Kythira. And when they are here we try to spend as much time together as possible. What is your favourite month on Kythera? This is a difficult question because we find every month on Kythera special. But the freshness and beauty of the spring period makes the months March until May our most favourite. And also because in this period we celebrate the very special Greek Easter. Because we are very busy we don’t have a lot of time to go to the beach. So when we go we don’t want to travel a long way. That’s why the beaches around Palaiopolis are our favorites. Big beaches which are easy to reach and have clear blue water, a beautiful environment and good restaurants. The whole coastline including the beaches of Limni and Kaladi is breathtaking. In March and April the beach of Kaladi beach is perfect for a swim because it is often protected from the wind. Also we get very happy from driving along the roads towards towards this area. It is impossible to name only 1 or 2 restaurants. The island has a lot of great restaurants and a lot have their specialties. We are always surprised about the high quality of the food. The food is fresh, it’s cheap and the people are in general very friendly. In Holland the Greek restaurants are known for their big meat dishes but actually the Greek cuisine has beautiful vegetarian food and great fish of course. We love a table with mezzedes and salates. This is the best and is kissing your tongue because of all the herbs and species. You can taste it all on Kythera. Does your guest house offer anything special? Outside the summer season people don’t come by themselves to Kythera so we organize some activities to get them to the island and let them enjoy the beauty of Kythera in Spring and Autumn. In fact there is an enormous market in Northern Europe for alternative tourism. These people are just waiting to discover Kythera. So from October until May we organize activities, for groups and individuals, like hiking, olive-picking, Christmas on Kythera etc. A lot of people on the island maybe don’t realize it but Kythera is a very special place. It is not easy anymore to find an island with such a natural beauty, combined with a lot of traditional villages, historical places, great beaches, no industry, no mass tourism, good food and very friendly people. Our guests tell us every day how extraordinary beautiful Kythera is and that there is ’something in the air’. And these are people who have been traveling all around the world and have also seen a big part of Greece. The nice thing is that no big investments are necessary to attract these guests because they like the island just like it is now. You have a small guesthouse with only 4 rooms. Can you make a living from that? Yes, instead of building a big hotel we decided make a small guesthouse because we think a lot of people prefer a smaller accommodation where you are directly in contact with the owner. We do everything ourselves, like the cleaning, the breakfast, the bookings, the website etc. It takes a lot of time but in this way we are sure we can offer our guests a perfect stay. We manage to fill up the guesthouse the major part of the year and earn our living from that. In April this year we won the Zoover award 2012 for the best Bed & Breakfast in the whole of Greece. We are especially proud of this because it is mainly based on the good reviews we get from our guests.